I remember hearing about Synergy many years ago as a way to share a keyboard/mouse between multiple computers with different operating systems sitting on your desk. This would have been a dream come true for me back when I had a Windows PC next to my Mac at previous jobs, but nowadays I tend to use Windows only through virtualization software, so Mac OS X is always underneath. teleport has completely changed the way I work! 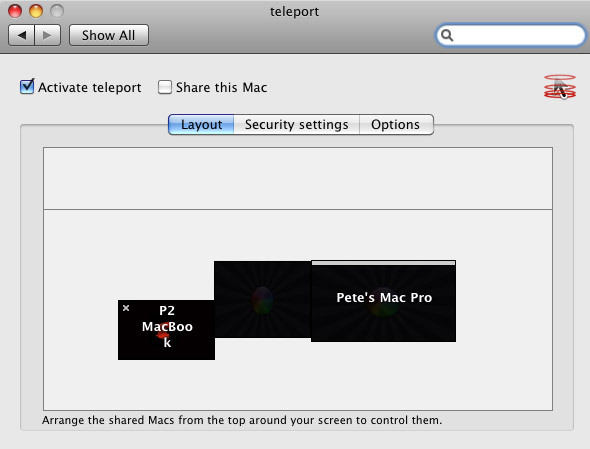 I was about to dig into Synergy when I came across teleport, which is pretty much the same thing, but Mac OS X specific, and since I don’t need the cross-platform stuff, I skipped Synergy and grabbed teleport. 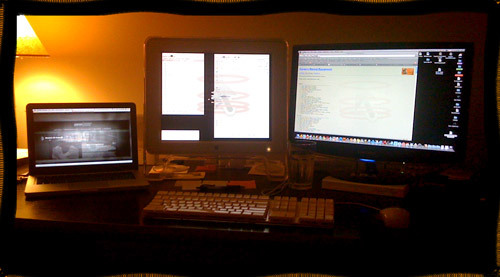 I’m basically controlling two completely separate computers with one set of controls. I can jump between them by just sliding the mouse to the edge of the screen. The power this provides is simply amazing… really, I can’t think of another thing that’s changed the way I work so dramatically in recent history.